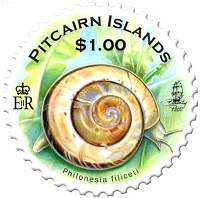 While land snails on Oeno and Ducie are few in number, like many other atolls in the Pacific, sixteen species from seven families are known on Henderson, with over half of these being endemic. 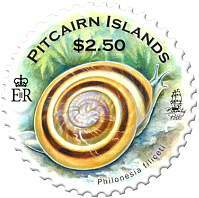 Analyses of archaeological deposits in caves near the North Beach have revealed that at least a further six species of land snail formerly occurred on Henderson. 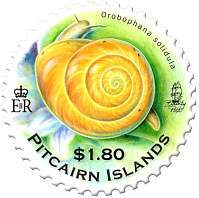 The volcanic soils of Pitcairn itself supports the greatest number of terrestrial molluscs with twenty-six species being found during the Sir Peter Scott Commemorative Expedition in 1991-92, and a further three recognised from museum material. One Henderson endemic Georissa hendersoni and three Pitcairn endemics Pacificella filica, Sinployea pitcairnensis and Diastole tenuistriata are described as new species. 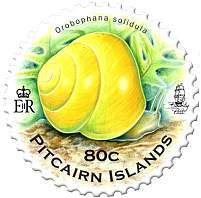 Preece does comment that the Pitcairn endemics occur in a limited area of less than one hectare and how it is important that such an area is kept free of invasive plants such as the rose-apple, that could threaten the snails’ survival. Orobophana solidula from Henderson lives on leaf litter, under limestone rubble or on various plants in coastal areas. Philonesia filiceti from Pitcairn is the less colourful species and can be found climbing on banana and fern leaves. 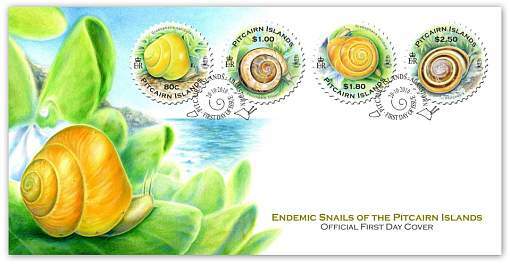 The Philatelic Bureau gratefully appreciates the assistance provided by Richard Preece in making this issue possible.